Just like humans, dogs also get excited when going for a road trip. However, although it is fun to travel with your dog, sometimes it can result to a bit of mess. The dog is likely to scratch the seat, leave mud or splash water into the car’s interior. This not only leaves the car dirty but it also comprises the cars odor. This means that you have to spend quality time trying to clean the car when you return home from long road trip. The good news is that you can prevent this by buying a well-made hammock style back seat dog cover that will protect both cloth or leather seats. In this article, we are going to give you reasons on how you will benefit from having a pet car seat cover. As a pet owner, unpleasant smell and stains are part of life. At some point, you will just find your dog messing up in your car despite the training that it has gone through. Such problems can result to lingering odor and unpleasant smell in your car. Some stains may stick in your car seat making it very difficult to clean. Buying a pet car set cover will help eliminate this problem. Being waterproof, it will help prevent urine stain from finding its way into the car seat. It will also protect your car seat against scratch and dog hair. 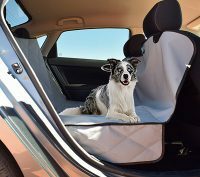 When you buy pet seat cover, you will never have to worry again about the hassle of endless scrubbing and unpleasant odors. When driving especially on rough road and your dog is on the back seat, chances are that the dog is going to wobble around. This is because the fabric of the car seat has not been design to firmly hold the dog in one place. This is very dangerous because it compromises the safety of the dog. A single mistake can cause serious injuries to your dog. Buying high quality pet car seat cover will help prevent this problem. Quality pet set cover have been made from slip resistant material that helps to keep the dog intact when traveling. Your dog will be at ease because it will not wobble of feel skittish. Other traveling supplies might also include extra water, pet travel bowls and other food/water products to keep you dog nourished and hydrated. If you are planning to be out with your pet during low light (dark) hours you may want to include one of the light emitting diode dog collars and/or a lighted dog leash to ensure that motorists can see you and your dog while walking. Your car’s interior is not designed to withstand dog scratches. This means that even if your car’s upholstery is made from tough vinyl or pure leather, it will still be vulnerable to dog scratches. For instance, if the dog sees something unusual stuck on the seat, it my start to scratch the car seat to get what it is looking for. This will result to car damage, a factor that will cost you a lot of money to repair. However, that will not be the case when you buy dog car seat cover. This is because seat cover has been made with tough material that is able to withstand dog scratch. Using it in your car will create a barrier between the dog and the car’s interior. This will help protect your car against damage, a factor that will save you a lot of money that you could otherwise have used on repair.